As millions of Americans celebrated Independence Day this weekend, I was reminded again of how the New Order represents the spirit of freedom and individualism in highsec. Of course, if everyone just went their own way and did whatever they wanted, we would have chaos. EULA violations and bot-aspirancy would abound. Instead, the highsec community came together and devised a Code of Conduct that everyone could agree upon. Now the good people of highsec live freely, but their free choices are organized and coordinated for the benefit of all via the Code, which they freely chose when they entered New Order territory. Wonderful! Those who violate the Code, on the other hand, lose their ships. Let's examine some of those losses, which occurred during the week of June 29th @ 00:00 EVEtime through July 5th @ 23:59 EVEtime. What better way to celebrate the Fourth than with fireworks? 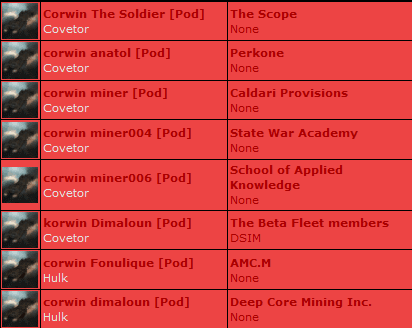 The "Corwin" miners, consisting of 6 Covetors, 2 Hulks, and all 8 of their Capsules, were detonated by smartbombs. Agents D400, John E Normus, Lanya Scentriver, and loyalanon used smartbombing battleships, which are quite rare since the insurance nerf and the barge buff. Special thanks to the rebels who put bounties on CODEdot: The bounties collected went to our Agents, whose smartbombs registered hits on each other's battleships. 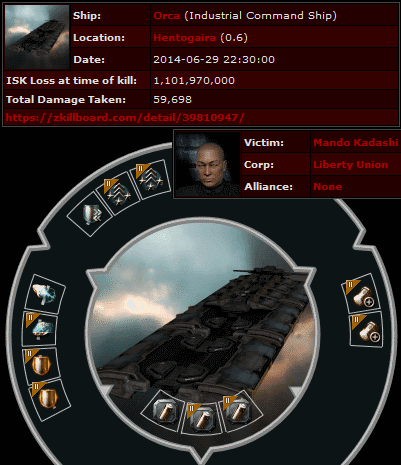 Mando Kadashi lost more than a billion isk when his anti-tanked, fail-fit Orca was terminated for facilitating an illegal mining op. The Orca was unusually expensive thanks to some pricy--but pointless--power rigs. Agents John E Normus, Brainbashi, iZaEaRl, Princess Suicide, Aaaarrgg, Jerry Rin, D400, Pod-Goo RepoWoman, Vapaustaistelija, Vargur Prime, Gank Gank, and V-ktor Dolus punished the perp. Mando lost an extra half billion isk when his pod got snagged. Oh, and he lost another half billion on top of that when his corpmates' two Mackinaws got popped. Some rebels think they can save their fellow Code violators by repairing them with logistics ships. Judging by the more than one hundred dead freighters last month, they've been misled. What actually ends up happening is that the rebels lose their logistics ships. 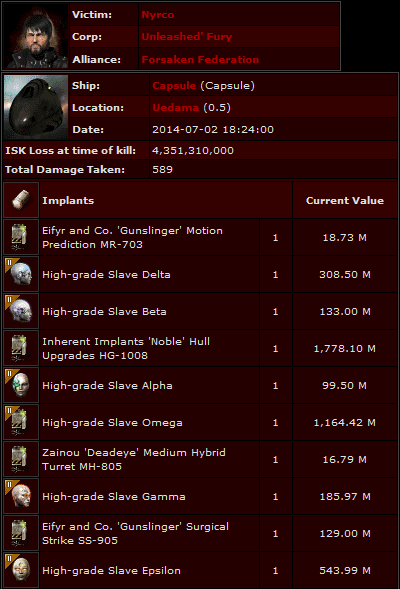 Christina Alabel was hanging around Uedama in a billion isk Scimitar. She intended to interfere with a gank, but she never considered that she might be the one on the gankers' menu. Agents IREALLYHOPETHISNAMEWILLF and D400 taught her an important lesson about the value of minding one's own business. 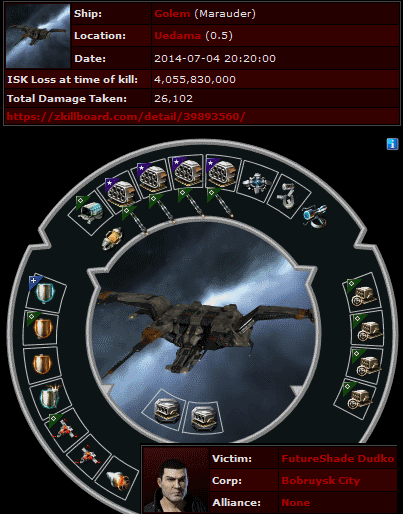 Want to lose 4 billion isk in a few seconds? You could do that by self-destucting a couple capital ships or a fully-loaded freighter. Or you could do what FutureShade Dudko did. He saw no reason why he shouldn't go AFK and auto-pilot through Uedama in a blingy Golem. After all, the New Order doesn't have in-game sovereignty in empire space, do they? Agents IREALLYHOPETHISNAMEWILLF and D400 proved highsec has transcended the petty sov game mechanics. The Code is very much alive here--unlike that Golem. Nyrco was auto-piloting AFK in a shuttle through Uedama. Apparently the other bot-aspirants told him that this is the cool thing everyone's doing these days. They're dead wrong. You know what is cool, though? I'll give you a hint: It ain't putting 4.3 billion isk worth of implants at risk because you're lazy and and disdainful of the Code. What's cool is following the Code and annihilating everyone who doesn't. Agent D400 was the one who popped Nyrco's shuttle and pod. Hey, why not? D400 was on every other kill this week, and besides--he's a pretty cool dude. The question for the rest of highsec is, do you want to be like Nyrco or like D400? Choose wisely! I agree, D400 is a pretty cool dude! because hes cool and doesnt afraid of anything! I have no sympathy for the logi pilot, you have to be on your toes to rep AFK ppl and avoid ganks. Can someone do the maths on the smartbombing battleships. I'm not convinced its a viable strategy. Its not about viable strategy Bobbins. Well ever the good players donate isk, ships and mods to the new order, then the elite pvpers will keep showing the afk players, botters that they aren't safe, in any class of ship. I'd say the math worked out fine. 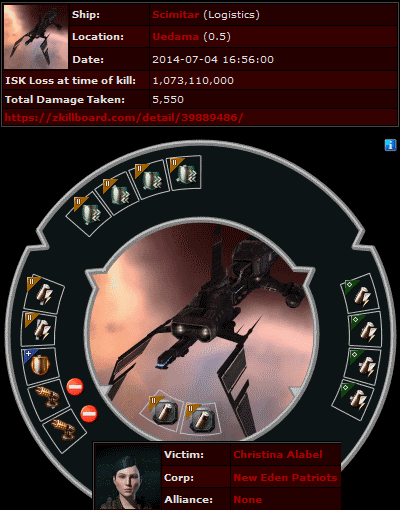 To be fair anon, the killboard is messed up because smartbombing ships hit each other. That gank was expensive, but the sheer number of losses made it worth it.